No matter your size or how you promote advertisers, we have the tools to help you grow. Awin has developed a number of tools with its tracking and interface to help publishers optimise their affiliate campaigns, and make money online through affiliate marketing as easily as possible. Awin's interface and reporting allows every user visibility on a range of data points across each of the advertiser brands they work with, including, cross device transaction tracking, order value, click to sale lag time, new and existing customer split and influence contribution, showing how many sales you've had a touchpoint in but not secured the last click. With easy to integrate tracking and tools, Awin's tracking solutions ensures all referrals get tracked for affiliates to earn commission. MyAwin is Awin's browser extension for Google Chrome, designed to make creating and adding affiliate links to affiliate websites as quick and simple as possible. By downloading the Chrome extension, a button will be added to your browser toolbar. When landing on an advertiser site, the button will offer several simple facilities; join affiliate programme if you're not already connected to the advertiser, quickly generate shortened tracker links, ‘one-click’ share links on Twitter, Facebook and Google+, generate custom URLs and generate links to specific product pages. The extension shows all the latest consumer offers from the Awin system and will highlight the exclusive vouchers available to publishers. For those publishers with multiple accounts, ‘one-click’ account switch functionality has been added for ease of use. Opportunity Marketplace is a tool that lets publishers list, manage and promote all of the advertising options that are available on their website. These listings can then be viewed and considered by Awin advertisers in an easy-to-use directory. The listings allow publishers to showcase the demographic audience they reach, the sectors they are active in, the types of promotional opportunities they are able to offer as well as the commission models they are open to working on. Opportunity Marketplace also facilitates easy communication between advertiser and publisher should you wish to discuss any opportunities in further detail before agreeing. Advertisers are able to view all opportunites posted to Opportunity Marketplace, so the directory serves as a location to showcase your publisher website to advertisers whose programmes you might not already be promoting. 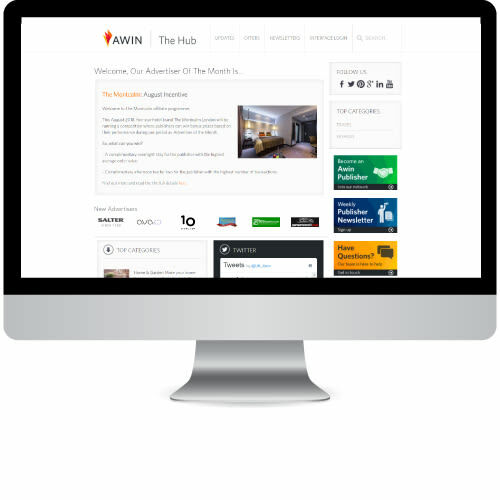 The Hub is Awin's offers portal where advertisers post their regular updates regarding their most popular offers each week, any key product focuses as well as sales messaging and new campaign launches. The Hub is browsable by all publishers and allows each publisher to see the offers available across the network. Each post is linked to the advertiser's profile page where, you can sign up to the programme if you're not already part of the programme, as well as providing tracking links which can be added to a publisher website in order to promote these key offers. To access The Hub, please click here. Create-a-Feed is the publisher interface for Awin’s product feed database which gives easy access to around 200 million in over 20 different languages. Create-a-Feed has been designed for all publisher types and sizes, product feeds can be customised through categories or advertisers and are available in a variety of file options to help you get the right product data on your site. Each created feed has its own unique URL so you can retrieve it as often as you like and keep the products on your site as up to date as they can be.